The Sri Kaliswari Trust was formed by Sri Kaliswari Group of Companies which is a leader in India’s Fireworks, Safety Matches, Pyrotechnics and Metal Power Industries. 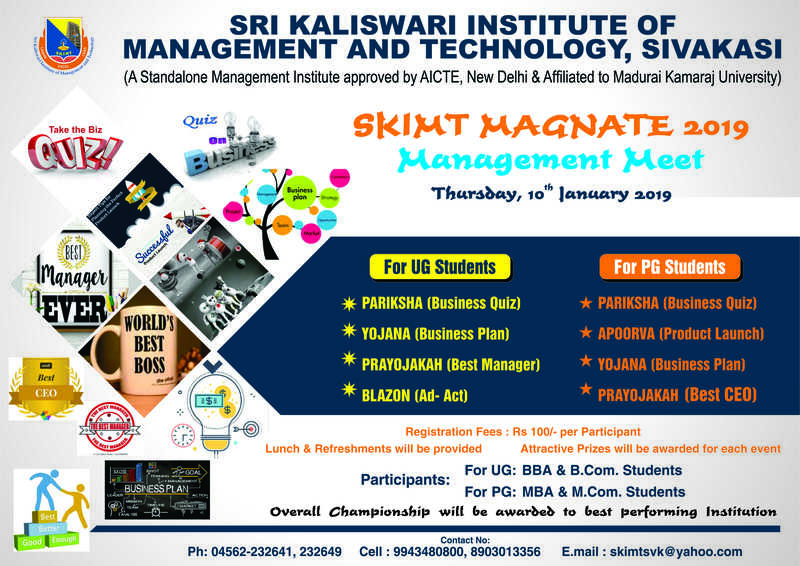 The Philanthropists of Sri Kaliswari Group of Companies with the wisdom acquired over 80 years of experience established a leading Stand Alone B-School in the name of“Sri Kaliswari Institute of Management and Technology” (SKIMT), Sivakasi in the year 2012. To be a Distinct Institution of Excellence for Developing Innovative Leaders who can transform the Business and Social Environment in the Nation and the World. To Create and Propagate Business Knowledge and Train Students for Managerial Decision Making and to Produce Highly Competent Professional Managers for the betterment of Business and Society. Life at SKIMT is buzzing with activities full of learning & excitement. Lot of events – Industrial tours, Management fest, Inter Collegiate Seminars, Workshops, Conferences, Guest lectures, industry Projects, Surveys & Celebrations - are organised for the students & by the students to enrich their learning & experience. A proper balance is stricken between academic learning & industry exposure. Skimticians will confidently challenge life & emerge as a successful person.